Holme Cottage in North Creake, Burnham Market in Norfolk, offers superb self catering accommodation in a wonderful location. Enjoying glorious views of lush fields, we are the perfect place to escape to from the hustle and bustle of modern life. The tastefully converted cottage has been thoughtfully furnished and sleeps up to 4 people. The cottage offers all the comforts expected of modern accommodation whilst retaining many original features including exposed beams, low ceilings and an inglenook fireplace with an open fire. 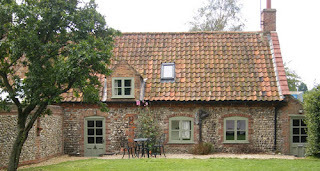 Holme Cottage is located within the North Creake Conservation Area. The village has a church, ruined abbey, duck pond, children’s playground and a pub serving food. It is ideally situated for access to both the coast and the many inland places of interest in North Norfolk. The North Norfolk coast is just 5 miles away with its varied attractions. The area offers miles of sandy beaches, sailing facilities, RSPB areas, a coastal path (part of The Peddars Way), golf courses, art galleries, antique shops, several National Trust properties and many pubs serving food.